The domain within your query sequence starts at position 615 and ends at position 1052; the E-value for the FH2 domain shown below is 1.66e-124. FH proteins control rearrangements of the actin cytoskeleton, especially in the context of cytokinesis and cell polarisation. 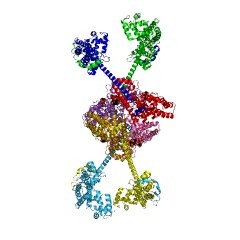 Members of this family have been found to interact with Rho-GTPases, profilin and other actin-assoziated proteins. These interactions are mediated by the proline-rich FH1 domain, usually located in front of FH2 (but not listed in SMART). Despite this cytosolic function, vertebrate formins have been assigned functions within the nucleus. 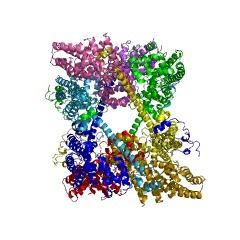 A set of Formin-Binding Proteins (FBPs) has been shown to bind FH1 with their WW domain. Formin homology (FH) proteins play a crucial role in the reorganisation of the actin cytoskeleton, which mediates various functions of the cell cortex including motility, adhesion, and cytokinesis [(PUBMED:10631086)]. Formins are multidomain proteins that interact with diverse signalling molecules and cytoskeletal proteins, although some formins have been assigned functions within the nucleus. Formins are characterised by the presence of three FH domains (FH1, FH2 and FH3), although members of the formin family do not necessarily contain all three domains [(PUBMED:12538772)]. 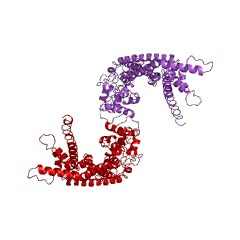 The proline-rich FH1 domain mediates interactions with a variety of proteins, including the actin-binding protein profilin, SH3 (Src homology 3) domain proteins, and WW domain proteins. 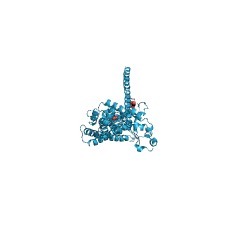 The FH2 domain is required for the self-association of formin proteins through the ability of FH2 domains to directly bind each other [(PUBMED:14576350)], and may also act to inhibit actin polymerisation [(PUBMED:14992721)]. The FH3 domain (IPR010472) is less well conserved and may be important for determining intracellular localisation of formin family proteins. 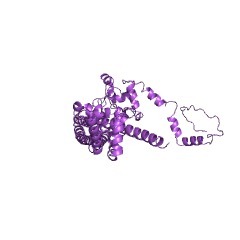 In addition, some formins can contain a GTPase-binding domain (GBD) (IPR010473) required for binding to Rho small GTPases, and a C-terminal conserved Dia-autoregulatory domain (DAD). 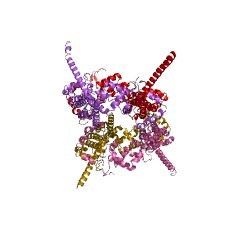 This entry represents the FH2 domain, which was shown by X-ray crystallography to have an elongated, crescent shape containing three helical subdomains [(PUBMED:15006353)]. There are 13612 FH2 domains in 13598 proteins in SMART's nrdb database. Taxonomic distribution of proteins containing FH2 domain. This tree includes only several representative species. 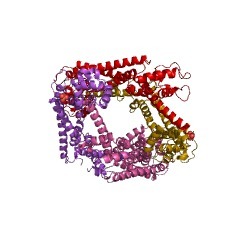 The complete taxonomic breakdown of all proteins with FH2 domain is also avaliable. Click on the protein counts, or double click on taxonomic names to display all proteins containing FH2 domain in the selected taxonomic class. Formin defines a large family of morphoregulatory genes and functions in establishment of the polarising region. Formin was originally isolated as the gene affected by the murine limb deformity (ld) mutations, which disrupt the epithelial-mesenchymal interactions regulating patterning of the vertebrate limb autopod. More recently, a rapidly growing number of genes with similarity to formin have been isolated from many different species including fungi and plants. Genetic and biochemical analysis shows that formin family members function in cellular processes regulating either cytokinesis and/or cell polarisation. Another common feature among formin family members is their requirement in morphogenetic processes such as budding and conjugation of yeast, establishment of Drosophila oocyte polarity and vertebrate limb pattern formation. Vertebrate formins are predominantly nuclear proteins which control polarising activity in limb buds through establishment of the SHH/FGF-4 feedback loop. Formin acts in the limb bud mesenchyme to induce apical ectodermal ridge (AER) differentiation and FGF-4 expression in the posterior AER compartment. Finally, disruption of the epithelial-mesenchymal interactions controlling induction of metanephric kidneys in ld mutant embryos indicates that formin might function more generally in transduction of morphogenetic signals during embryonic pattern formation. Diaphanous is required for cytokinesis in Drosophila and shares domains of similarity with the products of the limb deformity gene. We show that the Drosophila gene diaphanous is required for cytokinesis. Males homozygous for the dia1 mutation are sterile due to a defect in cytokinesis in the germline. Females trans-heterozygous for dia1 and a deficiency are sterile and lay eggs with defective eggshells; failure of cytokinesis is observed in the follicle cell layer. Null alleles are lethal. Death occurs at the onset of pupation due to the absence of imaginal discs. Mitotic figures in larval neuroblasts were found to be polyploid, apparently due to a defect in cytokinesis. 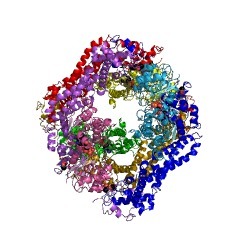 The predicted 123 x 10(3) M(r) protein contains two domains shared by the formin proteins, encoded by the limb deformity gene in the mouse. These formin homology domains, which we have termed FH1 and FH2, are also found in Bni1p, the product of a Saccharomyces cerevisiae gene required for normal cytokinesis in diploid yeast cells. This information is based on mapping of SMART genomic protein database to KEGG orthologous groups. 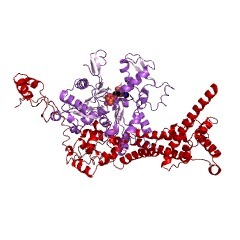 Percentage points are related to the number of proteins with FH2 domain which could be assigned to a KEGG orthologous group, and not all proteins containing FH2 domain. Please note that proteins can be included in multiple pathways, ie. the numbers above will not always add up to 100%.